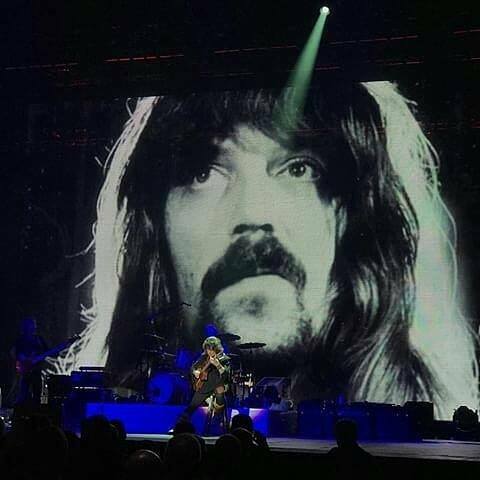 In a poignant and touching move, Ritchie Blackmore played tribute to Jon Lord at Rainbow’s show in Birmingham this week. Watch the performance below. A set of career encompassing photos of Jon appeared on the large screen behind the band as Ritchie, sat on a stool with an acoustic guitar, performed the song to a pin drop quiet capacity crowd. “Carry On… Jon” is the instrumental piece, Ritchie Blackmore wrote to honour Jon after his passing, and on Wednesday night, Blackmore performed it live for the first time at Birmingham‘s Genting Arena at the final of a run of Rainbow shows that started last Summer in Germany. “Carry On… Jon” was only done at this show. Rainbow keyboard player Jens Johanson added an atmospheric and jazzy Hammond solo to the piece, before Blackmore rounded off the song with a beautiful run of flageolets. That was very heart felt on Ritchie’s part. Beautiful tribute to a brilliant man! Rest in Peace Mr. Lord, you are missed by many. And thank you Mr.Blackmore for this tribute. Page-Plant, Lennon-McCartney, Daltrey-Townshend, Tyler-Perry, Jagger-Richards…….Blackmore-Lord. Beautiful, but why does someone always have to start a slow hand clap and spoil it? Another beautiful melody by Ritchie written to honor his main musical partner in life. Jon is missed by many and loved by all. Forget shredding, it is not the key element in guitar playing. Instead it is the song-writing that is the key and here, Blackmore shines. A beautiful piece and a shame that it only made it to Birmingham. A beautiful piece and a shame that it only made Birmingham. Hopefully a studio version will get released. Bravo por Ritchie al rendirle homenaje a Jon Lord un brillante y talentoso músico que admiré tanto en su carrera con la banda Deep Purple como en solitario……ambos músicos Jon y Ritchie y los miembros de las diferentes reuniones de otros importantes músicos que integraron en diferentes épocas la banda de Deep Purple hicieron historia memorable en la música Rock que le dió la vuelta al mundo…..mis respetos y admiración para ellos por su trabajo musical!